Like/follow DJ Peter Naughton on social media and save up to $50! Got requests? If I don’t already have them all, I’ll get them! Dance floor lighting to enhance the party atmosphere! Drive time up to one-hour each way between Fayetteville, NY (near Syracuse) and your event. Equipment set-up prior to event and tear-down after event. Liability insurance coverage – Never hire an uninsured DJ! A detailed contract – Never hire a DJ who won’t guarantee services in writing! Take your reception to the next level with uplighting! Instantly enhance any event space. They really pop once the house lights dim for dancing, and even moreso after sunset. Your investment: Just $400 when added to any DJ booking! Uplighting is not available as a standalone service or rental. $100 per hour or $50 per half-hour. Venues significantly over an hour away may incur additional charges, determined on a case-by-case basis. Contact me for an exact quote. Outdoor ceremony, with sound system under the tent to the left. Outdoor Events: ALL outdoor events require overhead shelter, rain or shine. No extra charge if I can set-up under an existing tent, awning, covered porch, pavilion, etc. You’re having your reception in the 10th floor Grand Ballroom at the Syracuse Marriott Downtown — due to the room’s size, I need to bring both of my sound systems and link them together in order to have twice as many speakers cover the room. No extra charge if the two areas are close enough to be served by a single sound system. Add $200 for the extra time/labor if a second sound system is required to ensure seamless music coverage as guests move from one space to the next. Not sure whether you’d need one system or two? 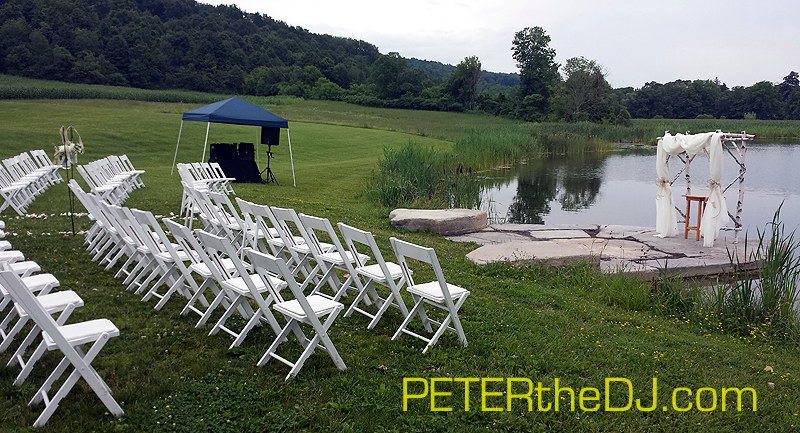 My Peter’s Pointers for Wedding Planning blog explains in further detail… or just contact me and we’ll discuss! Sound at Two Different Venues: If your ceremony and reception are at two different venues, and you need me for both, please contact me and we’ll discuss. Pricing varies depending on your specific needs. Again, no risk or worry — once your contract is signed, your costs are locked-in! Even if you decide to add more time or services later, you’ll enjoy the rates in-effect at the time your original contract was signed. Next Step: Lock in These Rates! I will confirm my availability for your event date. I’ll provide an exact quote and I’ll honor that price for 30 days, even if the rates posted on this page increase during that time. I’ll pencil you in on my calendar and I’ll provide a courtesy notification if I receive any competing inquiries. A signed contract and a booking retainer of $500 will secure my services exclusively for your event. The $500 retainer will apply toward the total cost of your contract. The balance is due 15 days prior to your event. Once a date is reserved, any other inquiries for any date that weekend will be declined. Accordingly, booking retainers are non-refundable and cannot be transferred to other dates or other people. Questions? Email me or text or call (315) 542-2112. I will respond within 24 hours, usually much sooner.